Identify Cotton Pygmy Goose - Wildfowl Photography. 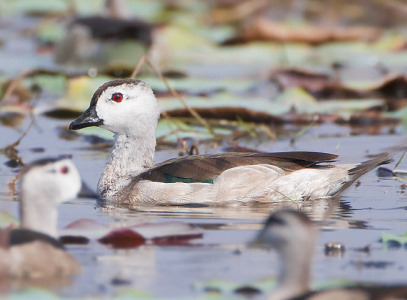 Appearance: - The male Cotton Pygmy Goose has a white face, dark crown, red eyes, greenish-black upperparts, white breast with dark narrow breastband, white underparts, white-grey flanks, dark tail, dark green-black wings with white tips, and legs and feet are blackish. The female is similar but has a duller plumage with dark eye-stripe, and brown eyes. Size: - Typical Adult is 31-38cm (12-15in). Food: - Aquatic plants, roots, leaves, grasses, and some aquatic invertebrates. 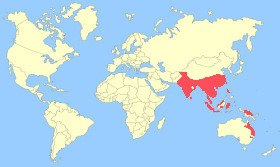 Habitat/Range: - Freshwater wetlands, lagoons, swamps, vegetated fresh-water lakes and pools throughout tropical Asia including Pakistan, India, Bangladesh, and into north-east Australia. Breeding Season: - Varies depending on locality and start of the rainy season. June to August in Asia and November to February in north-east Australia. Eggs: - 6 to 12 (ivory-white colour). Notes: - The Cotton Pygmy Goose, also called the Cotton Teal, is a small Asian perching duck. They usually nest in a tree hollow near water and will perch on the branch of a tree.